Recognizing the baggage associated with pendom term "transitional", there are a couple Waterman Patrician pens which have features that are off-catalogue for that model, and which evoke early/late findings for that pen. I've had the chance to photograph a couple over the years. I've seen several in Jade celluloid. This one has a pre-Patrician lever, an early-style riveted clip, the bland cap-band, and shortened black end plastic. What might be a nice feature of this photo is the juxtaposition in scale of a "transitional" with a conventional Jade Patrician, both with great color. Was this a pre-Patrician? Why is only Jade seen (assuming I'm not mistaken in believing only Jade is seen)? And, lest we grow bored with early-seeming Jade transitional Patricians, what then is the deal with these late-seeming(?) Turquoise Patricians that have what I believe is a late-style clip? Recollection (eep!) is that both mutant Patricians have non-Patrician nibs, but I don't insist. Interesting, I have the clip of the turquoise one you have pictured on a Green patrician! 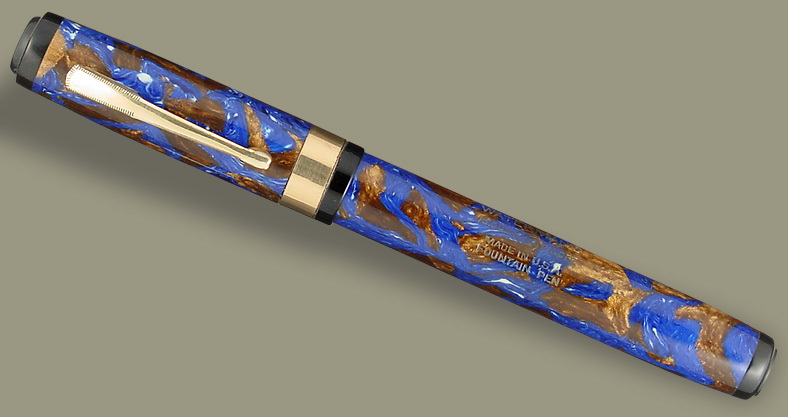 Not to give anything away (incidentally, the correct link for the "transitional" Patrician Pen Profile is here), but both versions are unquestionably late. The type illustrated in Turquoise is especially obvious, since that distinctive clip only enters the Waterman line well into the 1930s. So, the nib and feed in some seem late. That certainly can go with parts blow-out, analogous to punched-seal Wahls save for markedly more impressive style tweaks to the pen, the only feature shared for the Jade pens being the green tubes. Still, the early clip and lever seem odd for something blown out around 1940. Edited by MacKozinsky, 28 February 2019 - 09:28 AM.